David DelCollo | Attorney and Collector of Fine Motorcycles! Attorney and Collector of Fine Motorcycles! There are many reasons why a man may possess an undying love for motorcycles. It goes beyond the beautifully styled chrome contrasted with the supple leather accents. It goes beyond the throaty growl of the exhaust and the rumble of your body, harmonized with every revolution of the crank shaft as the pistons stroke the cylinder. It even goes beyond the perpetual presence one experiences when blasting down the highway,-no past, no future,-just now. True, unbridled freedom. But it is not just the love of the bike and the accompanying freedom that creates this magnetism to ride. There is an unexplainable passion that follows riding a motorcycle, maybe it is even transcendental, but it has time and time again driven a man to overcome amazing odds in the pursuit of his dreams. In the early 1920’s, a man named Roland Free moved from the long, cold winters of Chicago, to the warm Southern California sunshine, where he could pursue his love for riding motorcycles. Upon moving, he got a job at an Indian Motorcycle shop, selling by day and hitting the California bike scene by night. As motorcycle racing began to become mainstream, it was not very long before Roland began spending his spare time at the race track, honing his skills as racer. Having spent all of his time practicing and preparing, Roland was finally ready to enter his first national motorcycle race, the 100-Mile National Championships on the board track in Kansas City. Roland’s performance was so poor, he did not even qualify to enter the race. Roland spend the next 25 years striving to be a great motorcycle racer, with some occasional hints of greatness. But on one cool morning at the Bonneville Salt Flats in September of 1938, Roland did something that the world will never forget. 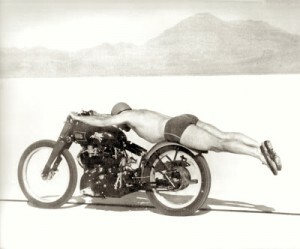 Attempting to set a land-speed record, Roland made two passes on his Vincent HRD, having no success. To make matters worse, on the second pass, Roland’s leather protective suit started to tear apart. Determined to succeed, Roland removed his jacket, pants, gloves, boots, and helmet, and laid flat on his motorcycle with not a shard of protective gear, wearing only a Speedo bathing suit and a shower cap. At 48 years of age and virtually naked, Roland “Rollie” Free launched across that flat at 150.313 miles per hour, not only setting the world land speed record on a motorcycle, but also changing the history of motorcycle racing forever. While Rollie Free taught us to never give up and to reach for our dreams, another man, Darius Glover, demonstrates that the unrelenting determination to achieve will not be broken, no matter the odds. On July 1st 2006, after years of rigorous practice and training, a 15 year-old boy named Darius Glover was getting ready for the race of his life. As he was practicing on the track before the race, he did not realize that before one particular jump, the ground had been recently watered down by the track crew. As he was approaching the jump, he felt himself losing speed, but it was much too late for Darius to slow down or bail from the bike, so he hit the jump without nearly the amount of momentum required to clear the jump. Anticipating the impact, Darius braced himself as best as he could, but when the bike’s frame hit the top of the landing, the bike bounced up and ejected Darius over the handlebars, and onto the ground. After that initial hit, matters only grew worse as the bike then landed directly on his back. After a few moments, Darius tried to get up, but could not, and he soon felt a severe burning sensation in his spine as he realized something was seriously wrong. But what Darius didn’t realize was that his life would be changed forever. Darius was unable to use his legs, paralyzed from the waist down. Bound to a hospital bed, a doctor walked into the room and said to Darius, “I’m sorry Darius, but you are paralyzed from the waist down, and you will never walk again and certainly never be able to ride a motorcycle again.” To the doctor’s surprise, Darius looked at him with a grin and declared, “you’re wrong.” And how wrong that doctor was. 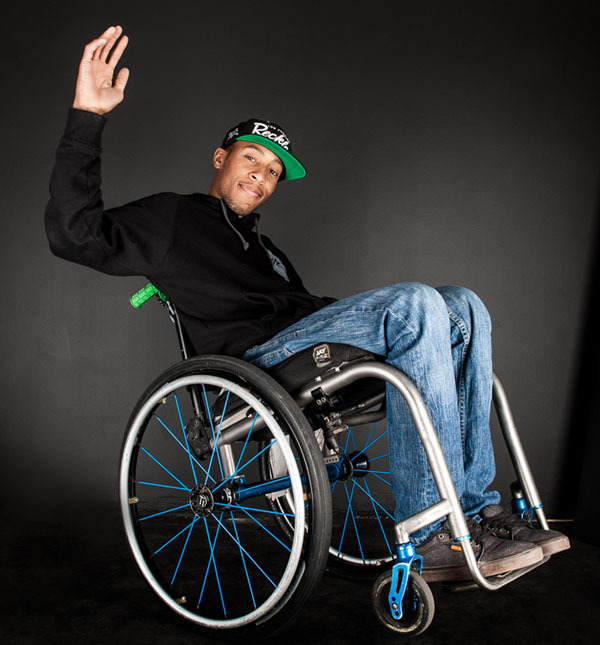 Darius Glover has become the first paraplegic motocross racer, professionally sponsored, and currently seeking the U.S. National Championship. And while Darius is actually affixed to the motorcycle and is unable to put his legs down when stopping, taking turns, or landing jumps–he has adapted. As Darius explains “the competition has a huge advantage because they can put their legs out, its kind of weight and balance. The way I ride is totally different than any other rider because they are able to pick themselves up if they fall, able to put their leg out, able to stand up on a jump…but I figured out how to do it.” What some may view as the simple task of riding a motorcycle has become a worldwide inspiration to people everywhere that you can never give up. “You’re still living, you’re waking up every day, you should be happy,” explains Darius, exemplifying that the human spirit can truly overcome any obstacle in life. David DelCollo grew up in the Philadelphia area. An avid reader, he excelled in the humanities and social sciences through middle and high school. It surprised no one when he announced he’d be enrolling at Duquesne University, one of Pittsburgh’s most prestigious private universities. Was Boy Scout Law Written by an Off-Roader? Boy Scout Law governs the conduct of millions of upstanding young men around the world. It’s basically a condensed version of the longer Boy Scout Code of Ethics, which offers specific guidelines for Boy Scouts’ dress and behavior. Despite its brevity — it’s literally just a series of adjectives separated by commas — Boy Scout Law is a highly respected document for aspiring young gentlemen. And it might as well have been written by an off-road enthusiast. Seriously. Those “crazy” people on bikes and four-wheelers. We’ve argued previously that motocross riders aren’t actually crazy or extreme, but that’s almost beside the point. When it comes to living by one’s better angels, upstanding off-road adherents like David DelCollo have plenty in common with Boy Scouts everywhere. Here’s how each of the tenets of Boy Scout Law apply to off-roading — and how you, too, can strive to be a better person on the track and trail. Trustworthy: Well, this one’s no surprise. Safety demands that off-roaders must be trusted to do things the right way, at the right time, all the time — and they need to trust their fellow enthusiasts to do the same. Loyal: Off-roaders are loyal to a fault: to their motorcycle brands, their favorite riders and their preferred courses, among much else. Helpful: In a sport that’s not without its share of danger, off-roading enthusiasts have to be helpful. If you don’t help a fellow rider in a pinch, why should he turn around and help you? Friendly: Off-roading is a social sport, even if some adherents are a bit rough around the edges. True enthusiasts are quick with a smile and even quicker with a grin. Courteous: Ever heard of “share the road”? Well, out here it’s “share the trail.” And that’s no platitude. Kind: Off-roaders are always quick to help out novice riders with useful pointers or friendly warnings. What goes around comes around. Obedient: Safety regulations and posted signs. ‘Nuff said. What do you think off-roaders are, animals? Cheerful: What’s more cheering than revving your engine past a crowd of appreciative onlookers (or, you know, on a deserted forest track)? It’s hard not to break into a smile out there. Thrifty: Off-roading isn’t the cheapest hobby in the world. No matter your station in life, you need to be thrifty to make it pay. Brave: If the idea of hopping on a four-wheeler or motorbike and gunning it into the woods doesn’t at least give you pause, you might want to rethink your priorities. Of course, the bravery on display at off-road facilities from coast to coast demonstrates that such hesitation is entirely surmountable. Clean: Not so sure about this one, actually. If you’re serious about off-roading, you’d better be prepared to get dirty. Real dirty. In fact, some off-roaders would argue that the sport’s “cheerful” factor is directly proportional to the “dirty” factor (or inversely proportional to the “clean” factor, as it were). Reverent: Off-roading is a privilege, not a right. Done properly, it can be a transcendent experience that elevates riders above the ordinary and provides new perspective on the natural world. Maybe that’s why off-roaders are a reverent bunch. Which Scout value best describes your off-roading philosophy? Pennsylvania is rightly known as the birthplace of American democracy. What the millions of schoolchildren and adult tourists who pass through central Philadelphia each year don’t see, though, is the rugged, wild beauty of the state’s rural precincts. From the topsy-turvy Allegheny Plateau in the west to the rolling bottomlands in the southeast and the remote Pocono Mountains in the northeast, Pennsylvania has no shortage of interesting and unique topography. What better way to experience Pennsylvania’s literal ups and downs than on the back of a bike or ATV? If you’re looking to get out into Pennsylvania’s fields or woods, kick up some mud and feel the breeze in your hair, check out these five awesome Pennsylvania motocross tracks. Nestled in the heart of the Allegheny Plateau, near the quaint town of Bedford, Breezewood Proving Grounds is a rugged ATV paradise with more than four miles of track and plenty to excite riders of any skill level. The heavily-wooded courses offer stunning vistas of the surrounding landscape, not to mention fixed obstacles sure to get the pulse pounding. You may also switch to the indoor pit track for a change of pace. Evansville MX Park has motocross and supercross amenities, plus miles of wooded trails suitable for all skill levels. Visit during the spring for a true “tough mudder” experience, or come back in fall for unbelievable foliage views. Once you’ve had your fill of the trails, head into the pretty, little town of Berwick for a bite to eat. Slippery Rock Dunes has a state-of-the-art motocross course and plenty of wooded trails to stretch your bike to its limits. With onsite campgrounds and modern restroom/shower facilities, you’ll be tempted to post up here for way longer than advisable. Also of note is the ever-popular kids’ track that’s renowned for its gentle grades and ever-educational obstacle course. Once you’re done biking for the day, drop a line into the property’s river and see if you can’t catch yourself some dinner out under the stars. Double down on Doublin Gap, where it’s all motocross all the time. This is one of Pennsylvania’s premier racing tracks. If you have any interest in learning how the pros get it done, Doublin Gap is well worth the drive. The track’s staff grooms nearly year-round, so you’re highly unlikely to run into trouble here. What’s your favorite Pennsylvania motocross track? Motocross Isn’t Scary or Extreme. Here’s Why. To the uninitiated, motocross is a dangerous sport best left to the daredevils of the world. The X-Games are fun to watch… from a distance. This position is understandable, prudent, even. But it might not accurately capture motocross’ risk-reward ratio. As it turns out, motocross isn’t nearly as dangerous or extreme as the man or woman on the street thinks. Many — perhaps most — motocross riders aren’t tattooed “lifers” with little to live for and everything to prove. Most are regular Joes with good day jobs and happy lives. Just ask David DelCollo, a Philadelphia-area lawyer who hits the track every chance he gets. DelCollo is your classic motocross weekend warrior. He’s made it something of a mission to educate the general public about the joys — and manageable dangers — of the sport he loves. Here’s what he’s learned over the course of his motocross career. “When I first started biking, I was surprised by motocross’ fairly strict hierarchy,” says DelCollo. It’s very much frowned upon for novice riders to rub shoulders with expert riders outside of controlled settings in which the novices know their place. If that sounds harsh, it’s meant to be; separating novices and experts ensures the safety of both. During racing events, less experienced riders serve as spectators while the big boys and girls are on the track. Then they swap roles when it’s their turn to dust up. Bikes come in all shapes and sizes. Just as toddlers aren’t allowed to ride scary roller coasters and junior high school students aren’t allowed to drive street-legal cars unsupervised, kids aren’t welcome on larger, higher-powered bikes. Smaller, lower-powered bikes are the motorized equivalent of training wheels for youngsters who want to get into motocross but don’t have the physical strength or coordination to safely handle full-sized bikes. As time goes on, aspiring riders “graduate” to bigger bikes. Unlike some sports that require highly-specialized safety equipment, motocross is less picky — and its safety equipment less costly. Regardless of their budget, riders can suit up head to toe with the proper safety equipment without breaking the bank. Many retailers offer deep discounts on safety equipment, using helmets and pads as loss leaders to sell higher-margin items. Well-run motocross tracks take a deadly serious approach to rider safety. Spectators are expected to serve as sentinels, identifying potentially unsafe situations (like a rider down in a dip) before other riders become aware. Like car racing, motocross has a host of safety regulations and “track rules” designed to keep riders on the straight and narrow, quite literally. “I’m very impressed with the professionalism and care exercised by track staff and fellow riders, at least at the facilities I frequent,” says DelCollo. “As a lawyer, I’m always on the lookout for things like that,” he adds, laughing. Motocross might not be as dangerous as laypeople believe, but that doesn’t mean it’s completely risk-free. It’s impossible to completely discount the risks associated with any sport that involves rough terrain, high speeds and heavy equipment. However, proper safety protocols and common sense can mitigate whatever risks do exist. Make sure your safety equipment fits snugly and wears securely on the track. Inspect the track prior to riding. Inspect your bike before riding. Perform regular bike maintenance, even if everything appears to be in good working order. Keep your core in shape for better bike control. Ready to ride? See you out on the trail or track! For the unfamiliar, the world of two-wheel racing is a bit perplexing. Do people really willingly suit up, hop on a bike or ATV and hit a muddy trail with reckless abandon? Except for the reckless part, yes, and it’s not just the usual adrenaline junkie suspects you’ll find out on the track. There are plenty of working stiffs who love nothing more than spending their free time with the wind in their hair and the mud at their back. Philadelphia attorney David DelCollo is one such working stiff, and he has plenty of friends and colleagues to ride with on any given Saturday. If you’re intrigued by the world of off-road motorsports, you’re not alone. Millions of people watch racing competitions; in fact, the segment is rapidly approaching the popularity of on-road racing spectacles like NASCAR and IndyCar. DelCollo makes it his mission to educate motorsport novices about the thrills and risks of his passion. For those thinking of making a go in the off-road racing realm, here’s his condensed list of the what, how, why and where. Off-Road Riding: Racing, Adventure or Both? ATV Rider helpfully divides its ATV-related content into two core verticals: racing and adventure. But riders don’t have to stick to one or the other. There are plenty of off-road racing events scattered about the country. If you’re committed to doing some traveling, you can easily find an appealing race every month of the year. Some events are certifiably “big time.” Take the GNCC Racing Series, arguably America’s premier off-road ATV racing event. GNCC events occur across the country on a regular basis. It’s a great idea to get psyched up (and initiated) for racing by spectating at a few before taking the plunge and trying out yourself. If you’re into the Zen side of ATV and off-road riding, that’s fine too. Check your local or state-level ATV association for information about trails in your area. Keep in mind that wide-track trails aren’t always open to ATVs and other off-road vehicles, so pay special attention to trails designated for motorsports. “Silent sports” trails, by contrast, are reserved for non-motorized activities: walking, mountain biking, Nordic skiing. DelCollo recommends taking stock of the trail resources and conditions in your area — and taking a hard look at how they might affect your safety, given your equipment. For instance, not all ATVs perform well in snowy or icy conditions, while others actually excel on slippery trails. Remember, there’s a big difference between ATVs and UTVs (utility task vehicles). Each has its own strengths and weaknesses on the trail. “Plus, riding alone presents some safety risks for less experienced riders,” he adds. Virtually every major metro area has more than one ATV and dirt bike enthusiast group. Some regions are positively thick with them, particularly in places with great off-road networks. A quick Google search or chat with a fellow enthusiast is sure to point you in the right direction. Off-road racing isn’t exactly pickup basketball — you don’t just walk onto the track one day and decide to make racing your new hobby. DelCollo certainly started slow; he’s the first to admit he didn’t feel comfortable on a bike until the fourth or fifth time he hit the track. For one thing, he wasn’t sure whether motocross and other off-road sports were really as safe as their proponents insisted. There’s also no shame in admitting that off-roading isn’t right for you. If you’re terrified by the thought of racing up and down a rugged, rutted track at high speed, or find that you become terrified after trying it for the first time, maybe a different hobby is in order. Then again, you won’t know for sure until you try.